Middle – Tower Bridge in the foreground. 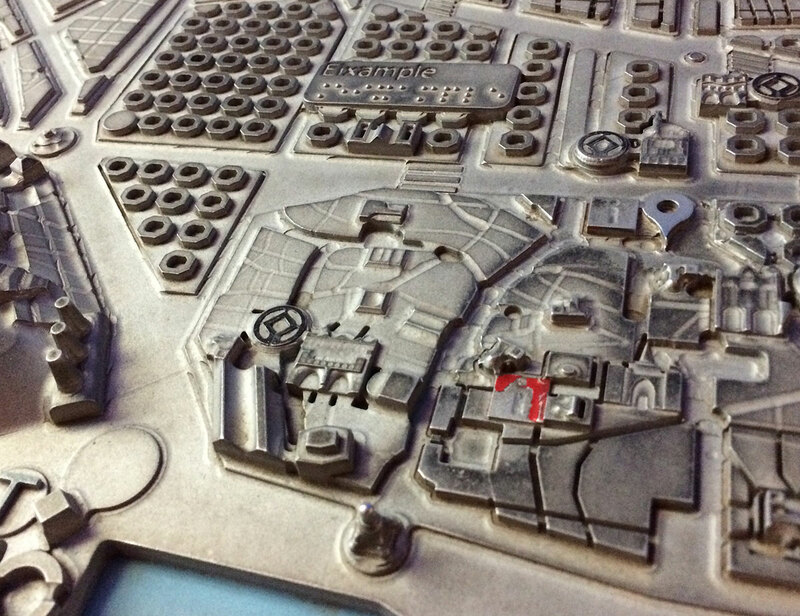 Perhaps City Hall (center) was designed for the sole purpose of being the most touched building on the map! 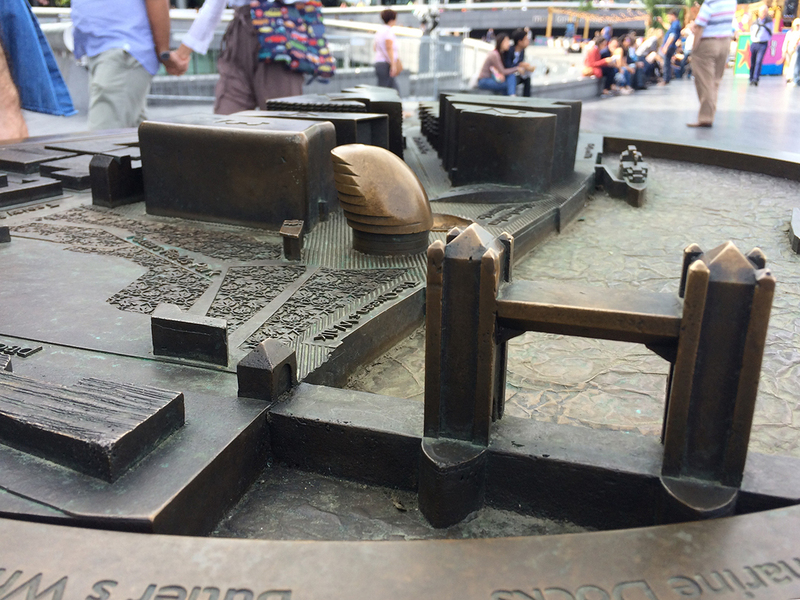 Right – Flying over Southbank, toward the Tower of London. 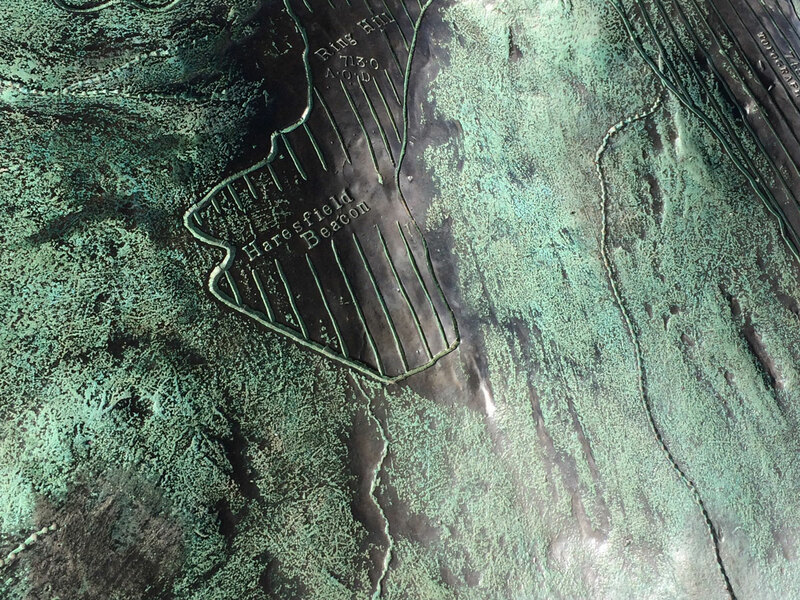 Three-dimensional maps, or raised-relief maps, are open to the elements. Patinas develop, dirt gathers and wear patterns highlight better known features. They stand ready and waiting for you to discover. 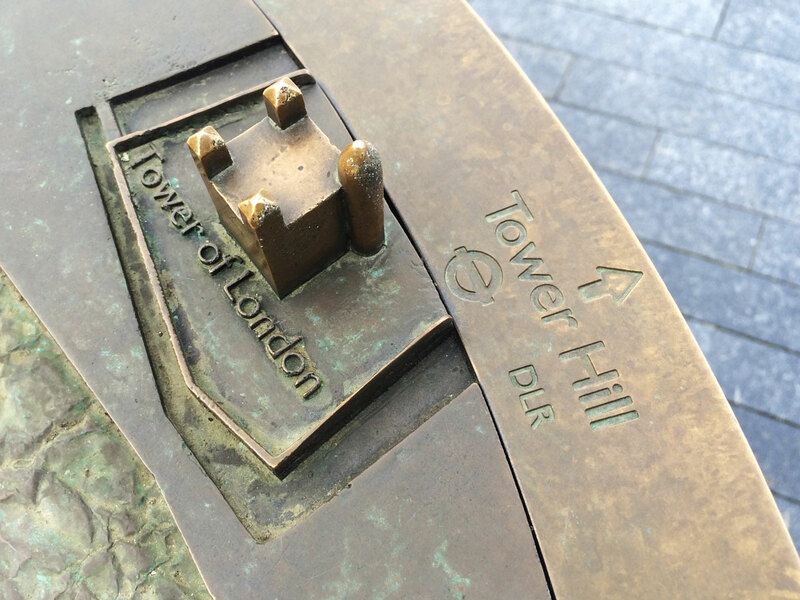 There is something visceral about touching the Tower Bridge on a map after you have crossed the actual one on foot, or running your finger up the hill you just hiked. It’s fun to get down at eye level of the miniature landscape and imagine how this tiny world meets up with what lies beyond. 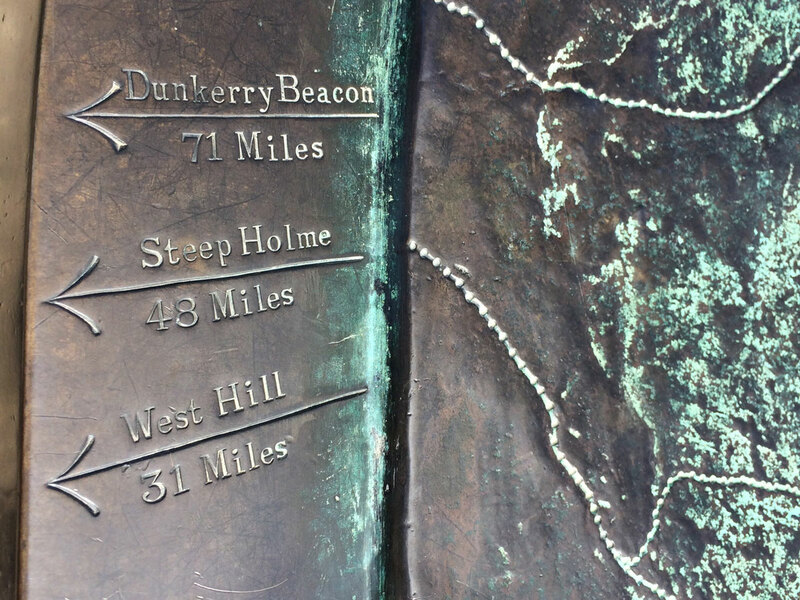 Left – The start of our hike was in Whiteshill. 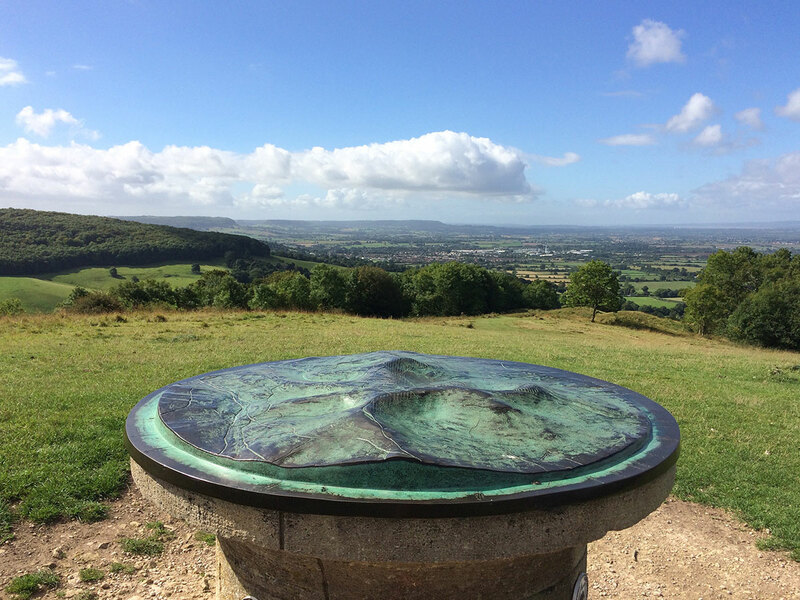 Walk off toward the left to that hatch marked area and eventually you will reach the “topograph” at Haresfield Beacon. Right. – This map was designed in 1934. It seems the “You are here” has been worn away. 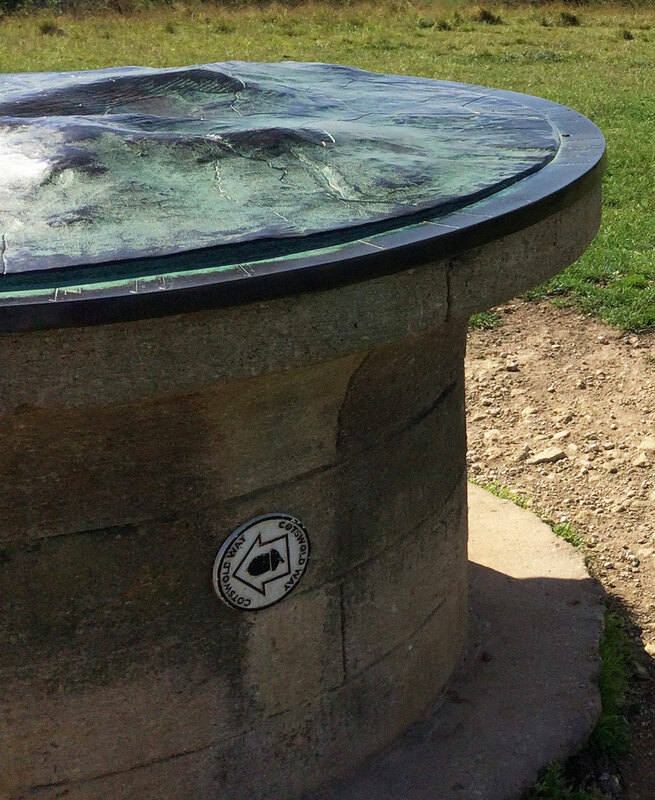 A marker for the Cotswold Way, a well known hiking trail. 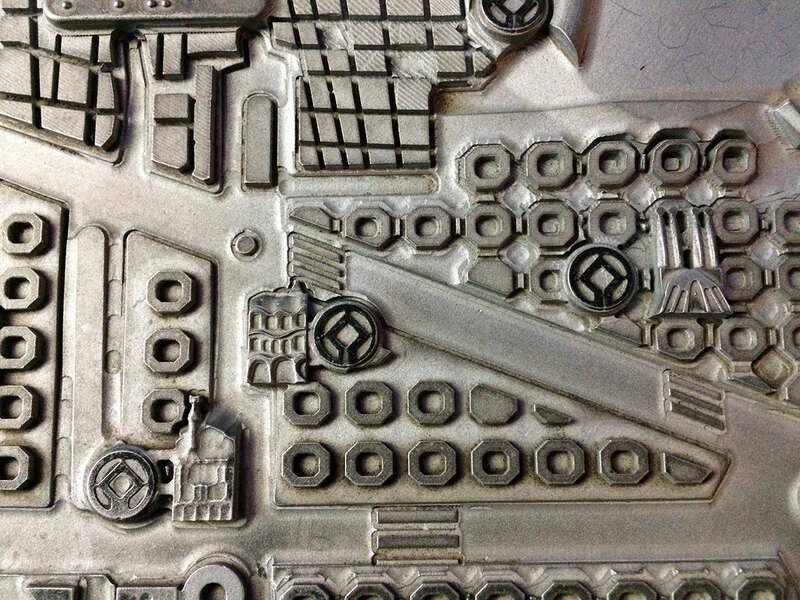 Left – A beautiful green patina makes the type stand out. Right – Keep walking, you have a way to go. 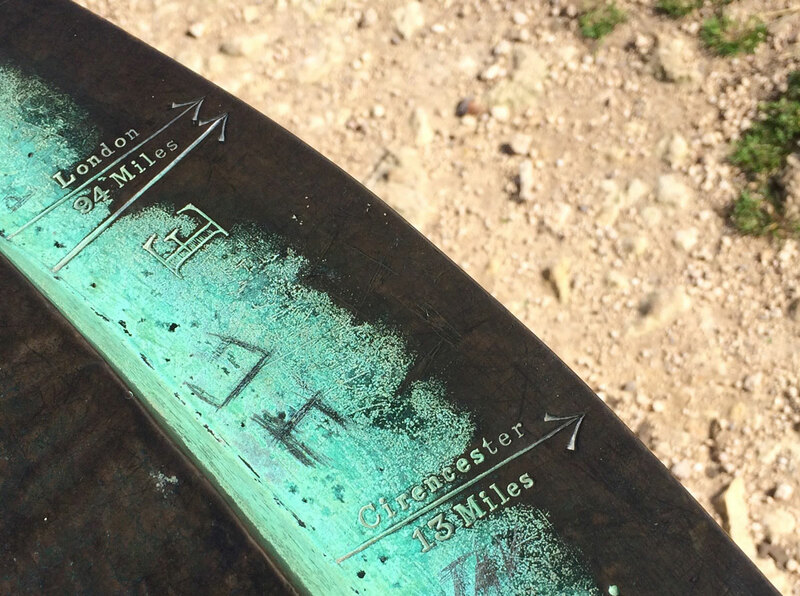 The points on the arrows look very much like Ordnance Survey marks. 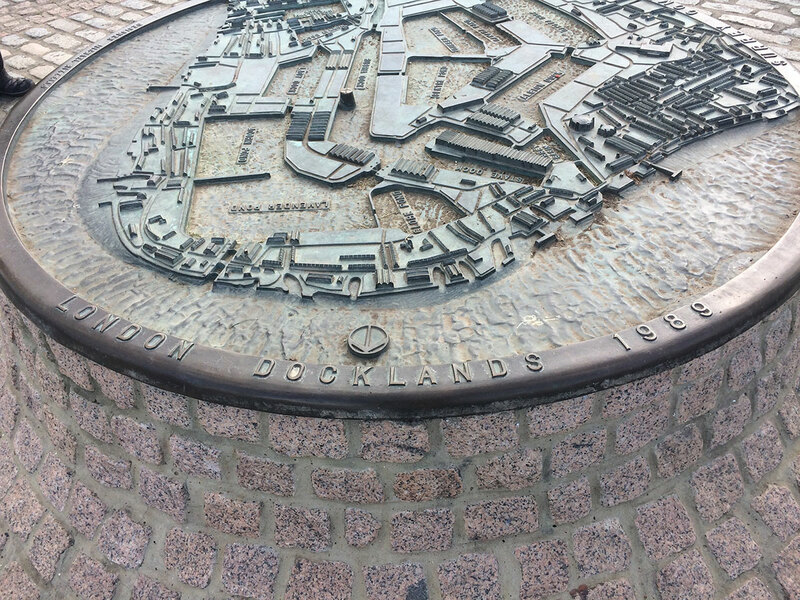 I usually don’t wish for rain when I’m outside, but I really would have liked to see this map of the London Docklands in Rotherhithe during, or just after, the rain. When it rains the canals and basins fill with water! Adding this dimension of time is a wonderful and playful addition. 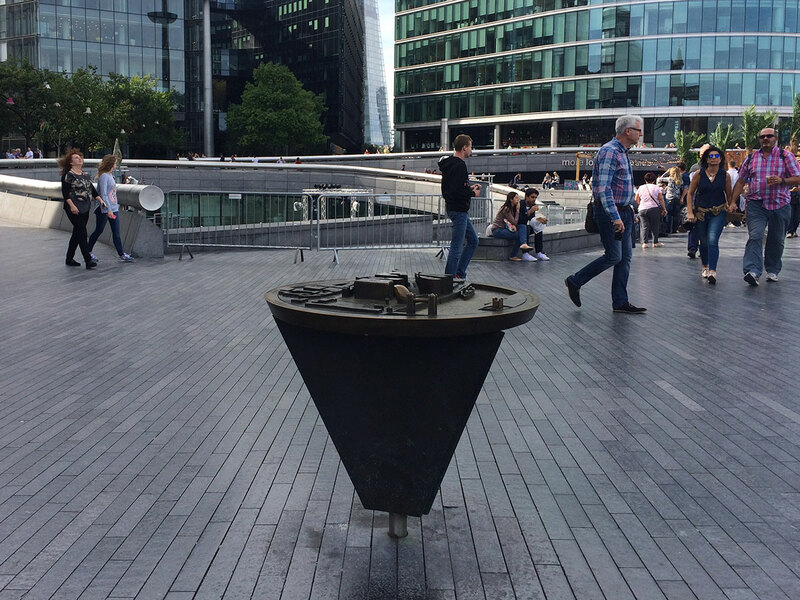 This work of art is integrated into its surroundings, and does not fight the elements, it incorporates the rain when it comes. 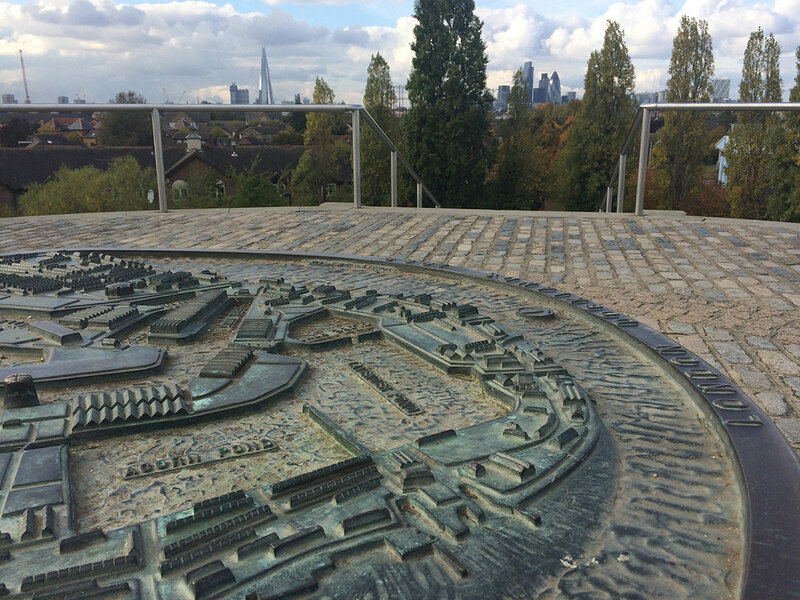 The Shard watches over what remains of the docks. 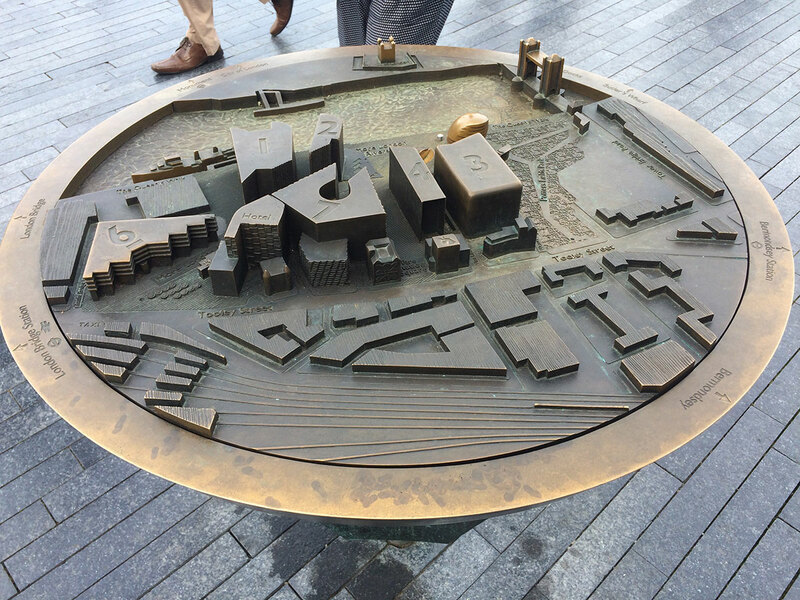 This piece of land was cut up for the docks, only two of which exist today, mainly as water features for the new community. 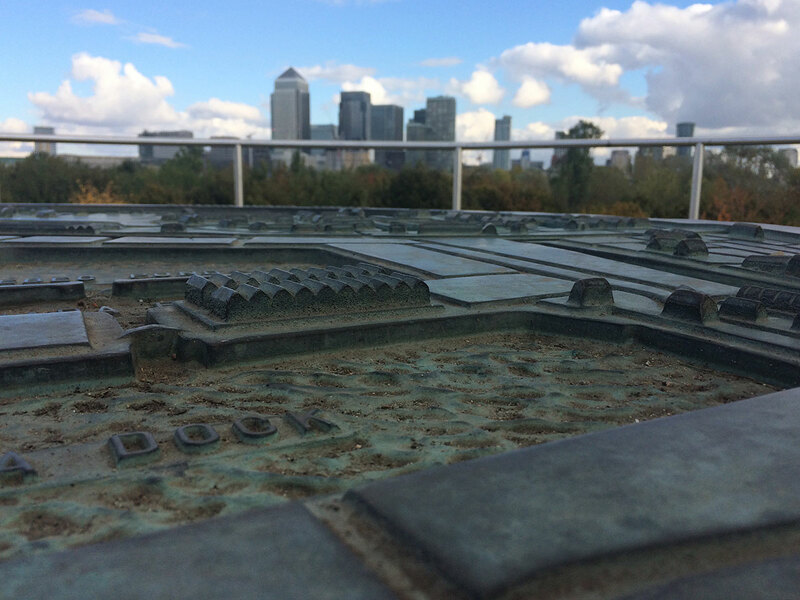 Left – Canary Wharf is across the river. Right – The worker housing, shown here, has been replaced by modern apartment buildings. 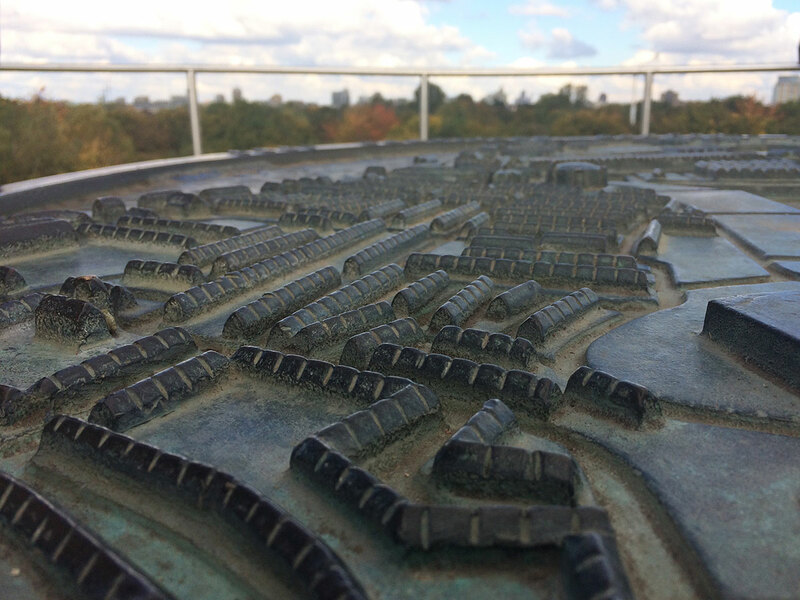 This map sits at the top of a funny little manmade round hill in Stave Hill Ecological Park (visible on Google maps, satellite view) where that cylinder is sticking up out of Russia Dock. 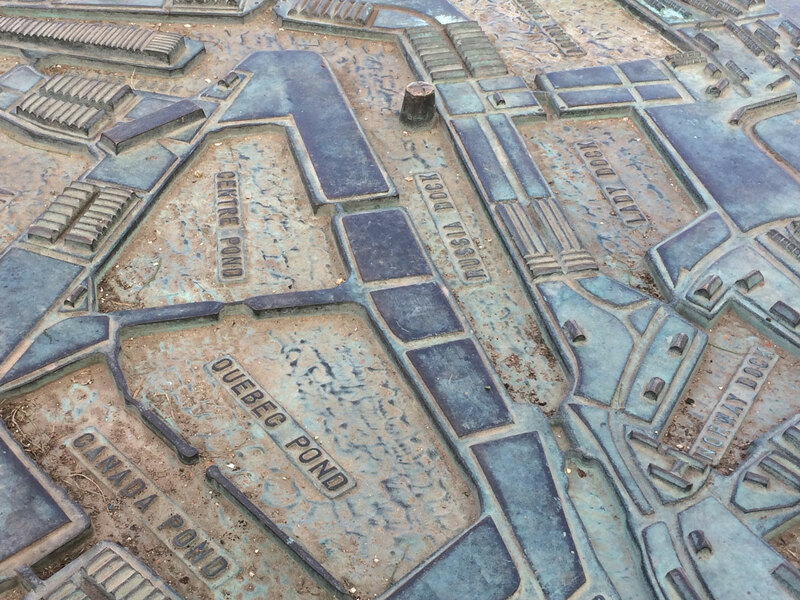 As you imagine the depressions filled with water, you get a history lesson of the area. Many of the basins and canals have been filled in, but you can see the old basin walls peak up along walkways in the park. 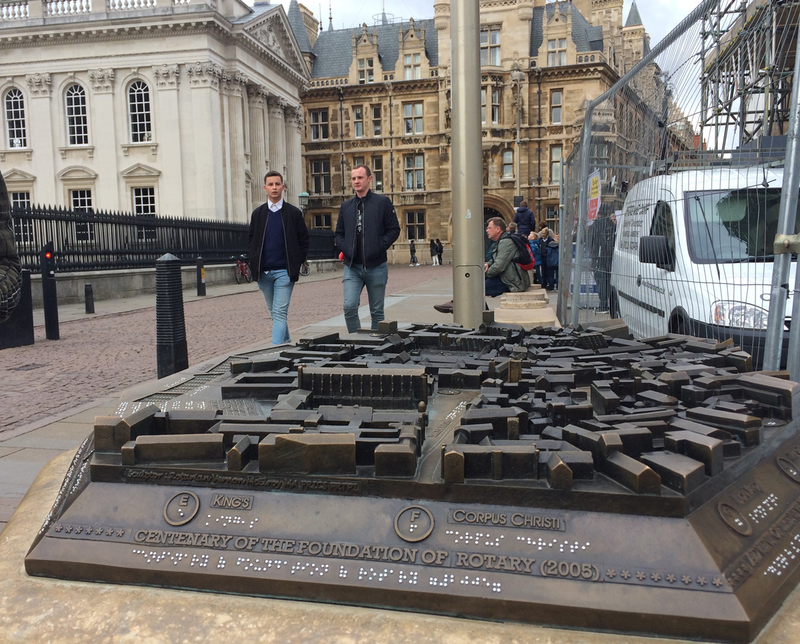 Other three-dimensional maps I’ve seen are to help sight impaired people, such as the one at Cambridge University. 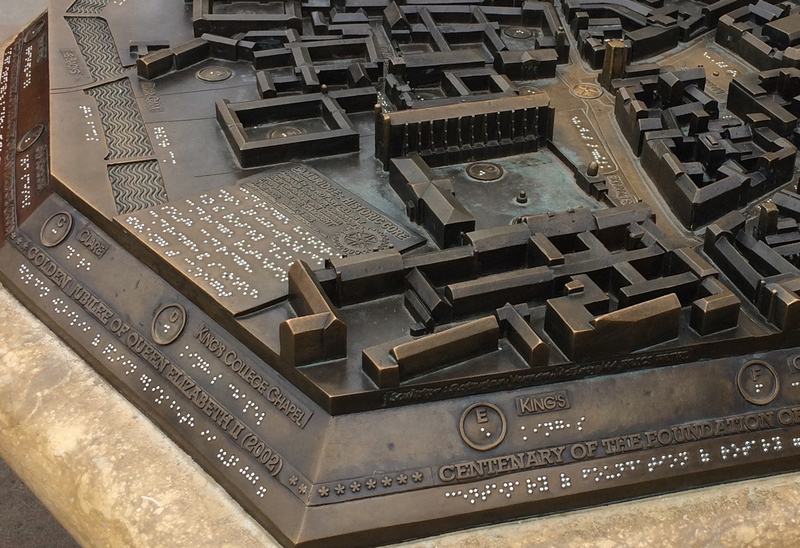 This is a tactile map of the campus with braille place names and explanations. 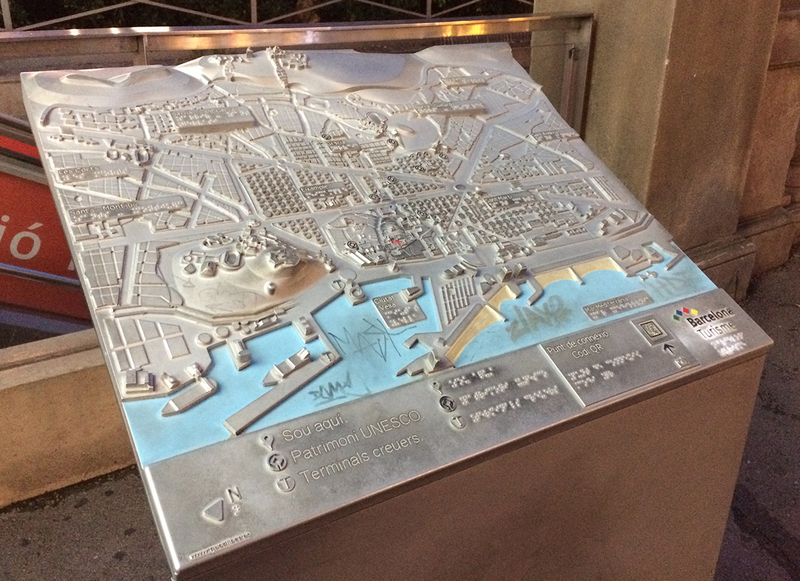 Another in Barcelona uses tactile symbols to identify nearby features. Barcelona – Three Gaudi buildings sit among the hexagonal blocks of the Eixample. 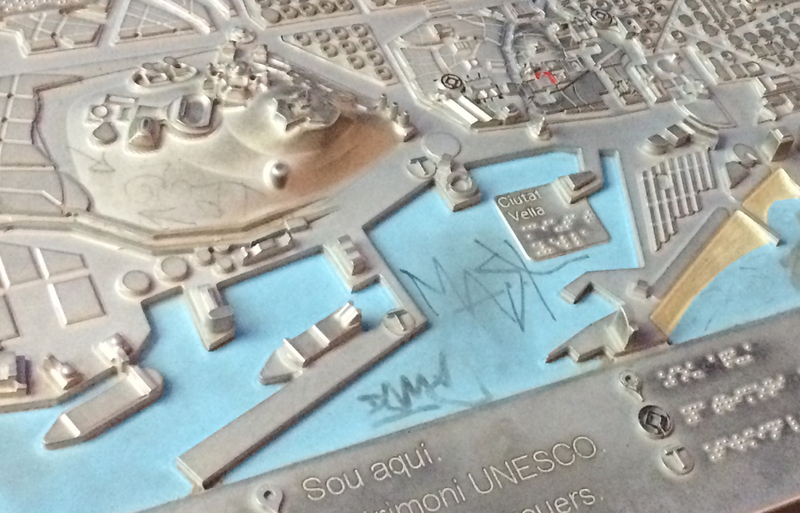 Left – The city map is located on the “sea” side of the Plaça de Catalunya. Right – The regular grid and distinct 8-sided blocks of the Eixample contrasts the Medieval streets of the Old City, both visually and tactically. Bottom – Information for both the sighted and vision-impaired. 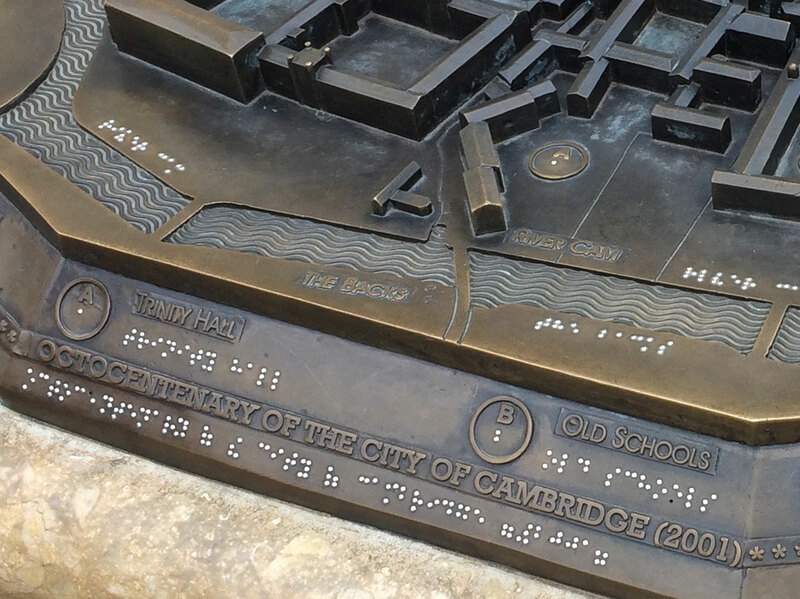 The tactile map for the blind and vision-impaired at Cambridge. 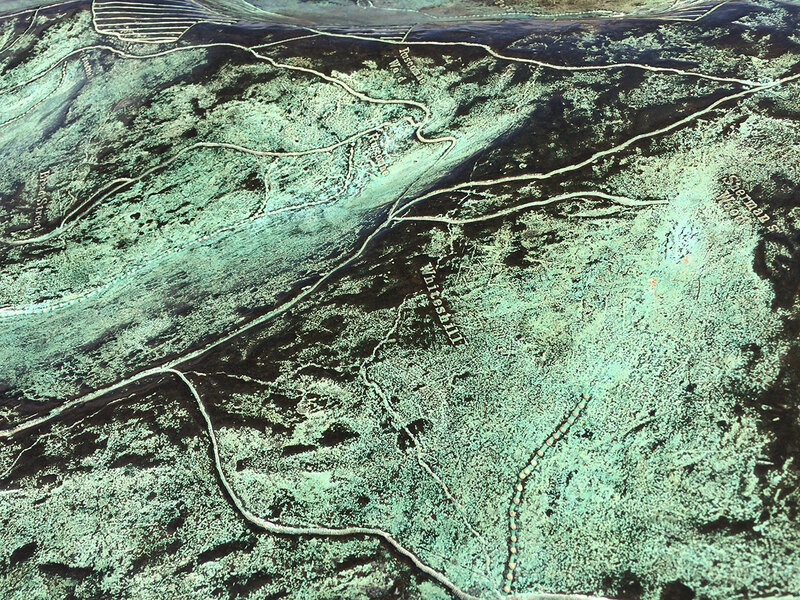 Note the pattern in the Cam River. Be on the lookout for these gems, and don’t be afraid to touch them! 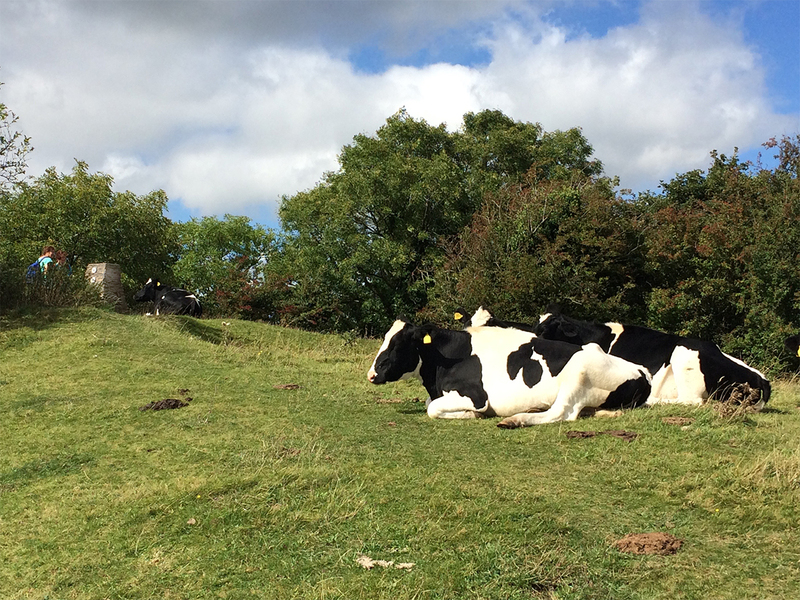 Cows, and cowpies, near the Ordnance Survey marker near Haresfield Beacon. Trust me, cows are a lot bigger in person. Here, they graze and rest along the walking path.